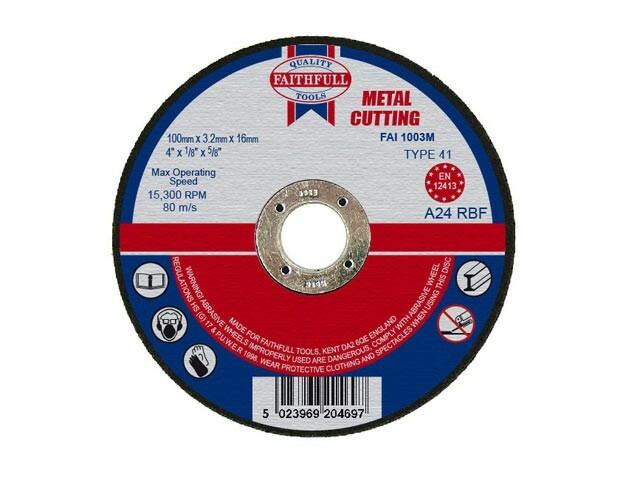 Metal Cutting Discs are manufactured using Aluminium Oxide abrasive grit with fibreglass reinforcing and resin bonded to provide both safety and optimum cutting performance. Discs with a 1.2mm thickness permit fine cutting where necessary on stainless steel and high grade metals. They must never be used for grinding and must always be presented to the workpiece at an angle of 90º. For use with a variety of machines, mini-grinders to stationary cutting-off machines. It is important to choose between a metal or stone cutting disc according to the material being cut, and to ensure that the correct wheel is properly mounted. Manufactured to EN 12413 standard.